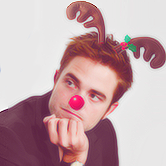 Robert the red nose reindeer. . Images in the Robert Pattinson club tagged: photo rkebfan4ever robert pattinson.